We seek to preach and to practice a religion devoted to justice and peace, responsive to truth with concern for the spiritual growth of all persons. Worship is scheduled at 10:00 - 11:00 AM each Sunday. 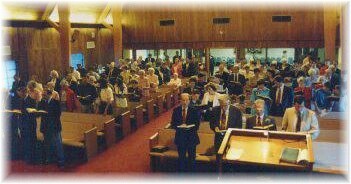 Sunday School for adults and children is offered from 9:00 - 10:00. During worship hours, childcare (infants through kindergarten) is provided for those who desire to use it. During worship hours, childcare is provided for children (infants through kindergarten). The nursery is located on the south side of the education wing at the end of the west hallway. Throughout the year, parents will bring young children for dedication. The dedication is a part of the worship service. It is a time for parents to give thanks for the birth of their child and for the congregation to commit itself to providing nurture, love, and support for the child and their parents. Sunday School classes (adult, senior high, junior high, elementary, kindergarten and preschool) meet at 9:00 AM. Just ask for directions and members will be glad to help you find your Sunday School class. Our youth and children's Sunday School program runs from the Sunday following Labor Day until the Sunday preceding Memorial Day. Appropriate ages are combined during summer. The "debts/debtor" wording comes from the Revised Standard Version of the Scripture. More information on our beliefs and practices is available.